For every intraday OR swing traders a good charting software is a must need. But by default Indian retail traders start trading with limited amount of cash in hand. So I hereby present one of the best charting software to download end of day data, ChartNexus. And the best part is that its 100% FREE. In this post I will show how you can download NSE end of day data with ChartNexus free of cost. Go to official site by clicking HERE. Click on sign up and register for a free account. Next click on the SOFTWARE tab and click on the FREE DOWNLOAD button to to go to the download page. Next click on the area that says CLICK HERE TO DOWNLOAD. This will go to Java update page. If you do not have Java updated you need to update it now. 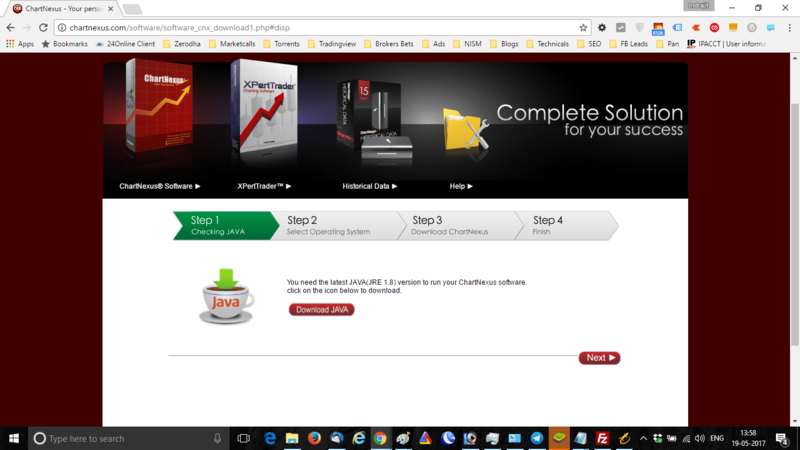 Once your Java is updated you will be taken to the ChartNexus download link. 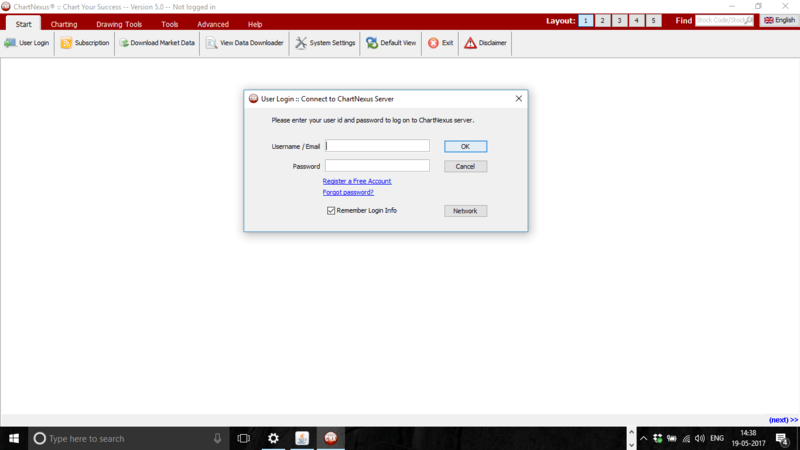 Click on DOWNLOAD SETUP to download file to your computer. 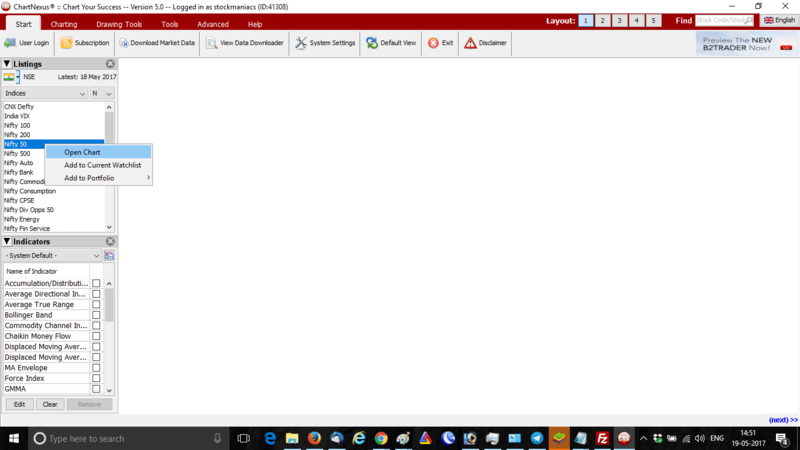 This will download chartnexus.jnlp file into your PC. 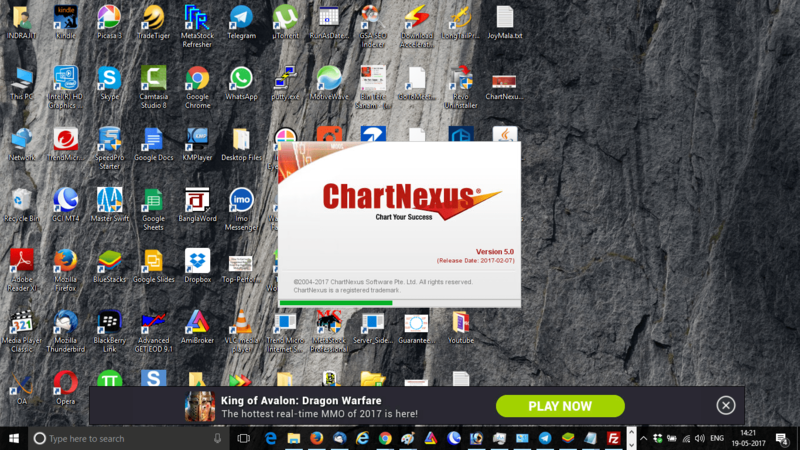 Double click on that and install ChartNexus to your PC. Once installed in will create ChartNexus icon on the desktop. Double click on that to run ChartNexus. Now login to ChartNexus using the email id and password you created at their website. 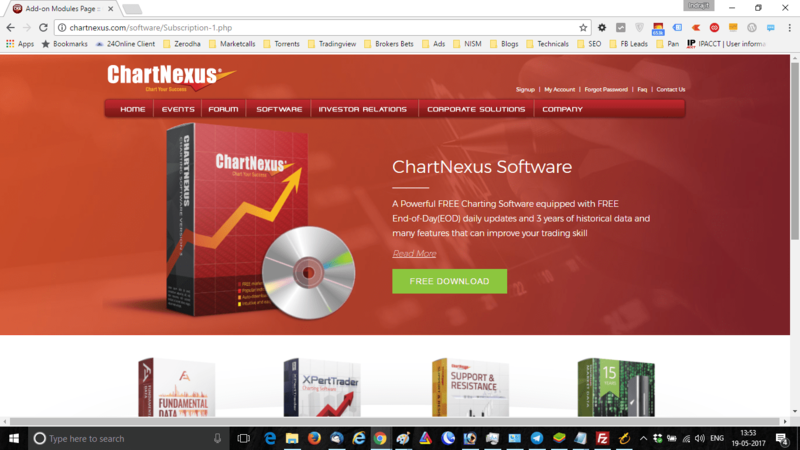 Now you are logged into ChartNexus, one of the best charting software. 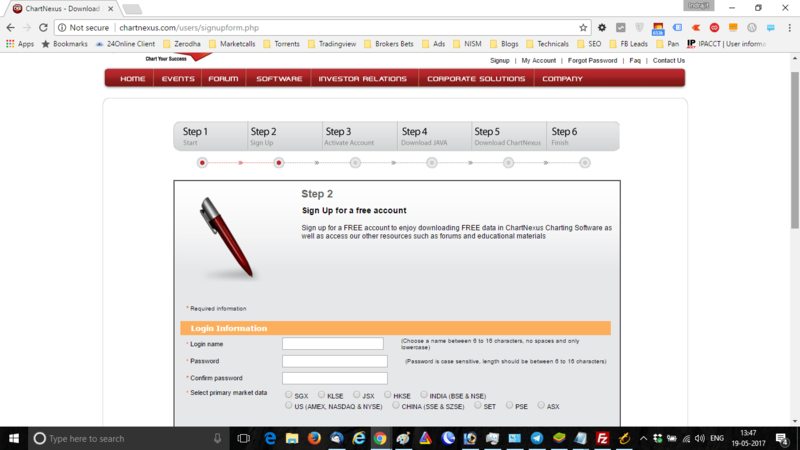 For the first time login it will ask you to download 3 years data. Also you need to select your market settings here. I select NSE for now, it will update data for the first time. Once the data is updated select your favorite script and open chart. Here I will open chart of Nifty index. This will open Nifty’s daily chart. You can attach any indicators to that chart. 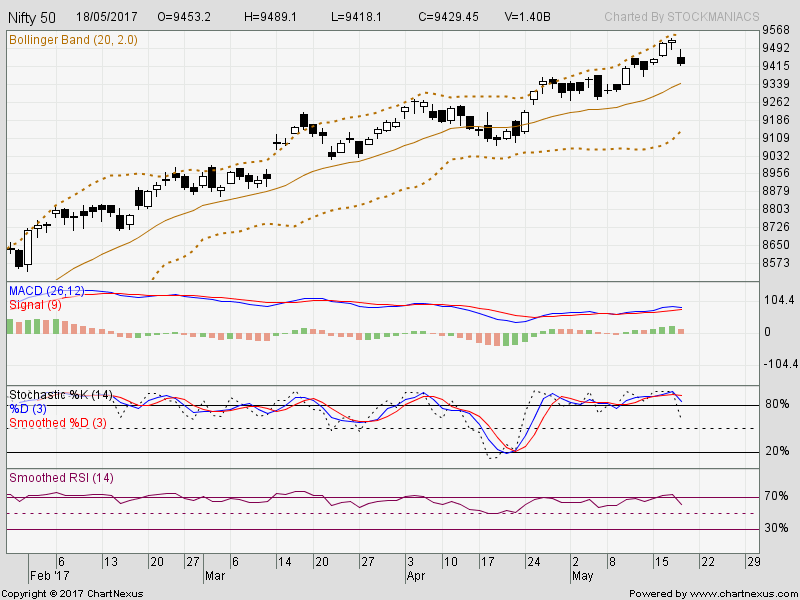 I will attach Bollinger Bands, MACD, Stochastics and RSI. Your ChartNexus setup is complete now. Start using it, you can understand why ChartNexus is one of the best charting software for Indian market. It is a daily chart so weekly pivots are showing. For intraday pivot points you need intraday data.